During the 5th century, a Buddhist Temple was built in Northern China. In a level area of the Songshan Mountains this little place of worship was nicknamed "Shaolin" which translates as "young forest." During the 6th century, a Buddhist Monk from China named Bodhidharma (most Chinese refer to him by his nickname, "Da Mo"), visited this Temple on his path to where the capital of China was at that time in Northern China. When Bodhidharma was introduced to the Chinese Emperor he was greeted with great enthusiasm. The Emperor had made many contributions to various Buddhist Temples and been supportive of this faith. He asked this prestigious Monk from India how his generosity would improve his place in the afterlife. Bodhidharma candidly informed the well-intentioned Ruler that none of his gifts would affect his afterlife. This did not please the Emperor at all. To further put this into perspective, remember that Chinese spiritual beliefs included the concepts of Heaven and Hell much like the Christians believe. Also, the Chinese customs included making offerings to the Gods and even burning money so that deceased relatives would have something to spend or purchase freedom from Hell with. Probably the only reason Bodhidharma survived this consultation was due to his being the 28th Patriarch or Disciple of the Original Buddha. Still, the Imperial Court was not interested in the pragmatic beliefs of this foreign Monk. Bodhidharma left the Royal City and went back to the Buddhist Temple named "Shaolin." As all Christians know, renovating a religion can make you a lot of enemies and even get you killed. Bodhidharma's beliefs were not well accepted at the Shaolin Temple either. They were so unreceptive that he gave up on them and resided in a nearby cave for seven years. During these years "staring at the wall," Bodhidharma wrote several books. 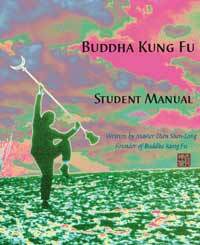 These books contained breathing exercises and Qigong movements that would become the foundation of Shaolin Gongfu. Of course, just as today, getting people to exercise is surprisingly difficult. These "Breathing Movements" that were supposed to "strengthen the bones and tissues" were not added to the Shaolin Temple activities. Evidently, Bodhidharma was so frustrated that the Monks could not see the wisdom of his writings that he refused to allow any of the older or younger Monks to study with him. Were it not for the fortitude of a Junior Monk named, Hui Ke, the history of China would be much different. This young Monk was so determined to be Bodhidharma's Disciple that he spent weeks standing in the snow outside the cave determined to prove his fortitude and loyalty. Most legends of Hui Ke claim he eventually cut off his left arm as proof of his sincerity. SPECIAL NOTE: Buddha Zhen does not encourage or even allow students to damage their bodies. Even tattoos and body piercings are discouraged. Should you want to be a Disciple of Buddha Zhen, we have curriculums that will not only give you the opportunity to prove your loyalty and dedication, these curriculums will improve your health and mind. This one-armed Monk studied the teachings of Bodhidharma and proved their effectiveness in improving spiritual growth by first BALANCING the Mind and Body so that one is READY for spiritual growth. Just as you can not teach a baby to read mathematical equations, so it is that you can not teach adults spirituality if they are not yet ready for it. Hui Ke became the 2nd Patriarch of Chan Buddhism. Although the Shaolin Monks may Bow and greet you with both palms together like a European Monk, they still often Bow and greet persons with only the right hand near their heart, in respectful memory of the First Disciple of Bodhidharma. The TV series, KUNG FU, starring David Carradine, was a favorite of the young Buddha Zhen Shen-Lang when he grew up in San Diego, California. When he moved to Los Angeles he sought Gongfu training with this Shaolin Temple concept in mind. When Buddha Zhen signed up at the Tai Mantis school in Torrance, California, he was enthused by the fact that the school's Founder was the Technical Advisor and one of the Monks in the Kung Fu TV show. Buddha Zhen studied at Tai Mantis until 1985 when his Instructor, Shifu Scott Stamps, graduated him. In 1984 Buddha Zhen (not near a Master yet), moved in with Shifu Stamps. By day, Shifu Stamps worked as a computer programmer. "He had a photographic memory. He was the most knowledgeable Instructor at Tai Mantis. He knew more Gongfu Forms than any of the other Instructors and thanks to his photographic memory, he remembered them more accurately than anyone else. I was very, very fortunate to have him as my Shifu." Almost everyday, when Shifu Stamps would come home from work, Buddha Zhen would be waiting in the living room for him. "I'd hardly give him time to go to the bathroom before I'd have him reviewing my recent lessons -- demonstrating to him that I was READY for my next lesson. That's how I was able to learn 10 years worth of Forms in just three years." 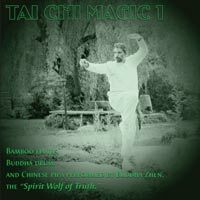 When Shifu Scott Stamps graduated Buddha Zhen, he commented, "I have taught you everything that I was taught." This was an amazing amount of knowledge: 13 Praying Mantis Forms, over a dozen Weapon Forms, the 10 Shaolin Forms, the 12 Tantui, and various training methods. Buddha Zhen was fully aware of the value of his education and kept journals and accurate notes on all his Gongfu Forms. These notes would later aid him in forming his own Gongfu School in Utah without any Instructors or School Brothers to help him. Still, both Shifu Stamps and Buddha Zhen realized that they were both lacking in the Buddhist studies normally associated with Shaolin Gongfu. Shifu Stamps journeyed to Japan to increase his spiritual knowledge and was accepted as a Disciple of _________, in the village of ___________, where he lived and studied for two years. Buddha Zhen pursued his Buddhist studies as a Journeyman Carpenter. When the Tai Mantis school in Torrance closed up, some of the students from Tai Mantis would venture to Buddha Zhen's house on a regular basis to workout with him. "Although I was leading the classes, I still did not really think of myself as a Gongfu Master, or even an Instructor. Still, more and more people were coming to my house and I had to start scheduling them so I could pursue other activities. By the time I moved out of my condominium in 1991, I had a minimum of 7 students and classes going 6 days a week. I was even on the set of the Patrick Swayze movie, "Roadhouse" teaching Taijiquan to the Prop Master. He showed some moves to Patrick who used them for his 'Taiji scene' in the movie." Several other Utah religions embraced the spiritual and physical teachings of Buddha Zhen. "It would appear that people who pursue 'The Truth' can recognize it, no matter how you 'label' it." Buddha Zhen was even invited to Sunday sermons to share his enlightenment with parishioners. "Perhaps I have had it easier than Bodhidharma did, yet still, I feel that my 8 years in Utah were spent 'staring at the wall' much like Bodhidharma did when he was not accepted. Even those who thought they were dedicated and claimed to be my Disciples, were not as spiritually ambitious as one must be to pursue Shaolin Zen. Most religions require you to just hold still, shut up and listen to what they say. There is no discussion on how this relates to each member's life, and there is no flexibility in adapting religious information to suit the needs of each member. This sounds unenlightening, yet, as I have learned, most people would rather be religious couch potatoes than spiritual warriors. And that is really what Shaolin Zen is about," explains Buddha Zhen Shen-Lang. "All Buddhism is meant to lead you to your own spiritual purity, just like the first Buddha did. Every Buddhist is either on the path to being a Buddha or they are just Buddhist couch potatoes. Shaolin Zen is just a lot more aggressive about it. Thanks to Bodhidharma, we can get to Buddhahood quicker, it takes a lot more effort, but who isn't willing to devote more energy to their spiritual evolution?" Buddha Zhen laughs. "I know the answer to that. So do you. Not very many people pursue enlightenment. And now, thanks to Christianity, people believe they are born evil and Christianity has taught people to believe that Christ was not even a human, so his life could not possibly be emulated by any mortal." Buddha Zhen shakes his head in disappointment. 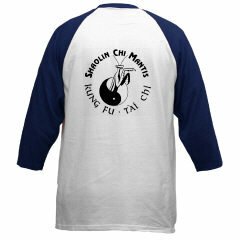 "Shaolin Zen is about mastering your body so that you can master your mind. The complex Gongfu dances require incredible mental effort and development. Combine this with appropriate spiritual concepts and the Disciple is capable of perceiving reality in a much broader sense. Since spirituality is an advanced form of existence, how can you expect to master it before you've mastered your own body?" Buddha Zhen went on to explain about the LUOHAN, who are the spiritual guardians of Buddha, similar to the Archangels of Christian teachings. For more information and lectures from Buddha Zhen, take a journey on the DHARMA TRAILS we are constructing here in this Shaolin Chi Mantis website. These Dharma Trails, for Members of Shaolin Chi Mantis, provide hundreds of lessons and guide Shaolin Chi Mantis students to develop their bodies (using Gongfu and Taiji), balance their minds (using the textbooks and curriculums by Buddha Zhen), and appreciate life from a spiritual perspective.